Why does SPE have an awards program? Peer recognition is an important aspect of every professional organization. SPE members make many significant technical, professional, and service contributions to the worldwide petroleum industry. The SPE Awards Program recognizes our members’ contributions to the oil and gas industry and petroleum engineering profession. Additionally, these awards recognize exceptional service in the Society and greater community. How does the SPE awards program work? The SPE awards program is nominator-driven. You cannot submit your own nomination. You decide to nominate your colleagues to recognize their professional, technical, and/or service accomplishments. You submit the nomination online. You can submit letters of recommendation collected from colleagues or you can request letters of recommendation by providing email addresses (for international awards only). Award nomination packets are provided to award committees made up of SPE members. The committee selects the best candidate from the nominations presented as the recipient of the award. What are the differences between SPE International and SPE Regional awards? Learn what Regional Awards recognize. Award committees appointed by the SPE Regional Directors select SPE Regional award recipients. Regional awards are presented in each SPE Region. Regions accept nominations for SPE member candidates in that region. Nominators do not have to be in the same region. You submit regional nominations to https://app.wizehive.com/apps/menu/speregionalawards. Regional awards do not accept letters of recommendation. The deadline to submit SPE Regional Award nominations is typically 15 February. The Regional Director may extend the deadline. Recipients of SPE Regional Young Member, Distinguished Service, faculty, and technical awards automatically move into consideration for the equivalent SPE International Award in the year following their selection as a Regional recipient, assuming the candidate meets all the international criteria. Regional awards are presented at an appropriate Region or section meeting. Regional awards have 1 year of consideration. Candidates must be re-nominated each year. Award committees appointed by the SPE President-elect and approved by the SPE International Board of Directors select SPE the International Award recipients. SPE International Awards are presented globally without regard to a recipient’s region. SPE accepts international nominations directly from SPE members and from SPE Regions. It is not necessary for a candidate to have received a regional award to be considered for an SPE International award. The deadline to submit SPE International Award nominations is February 15. There are no extensions. The SPE international Board of Directors must approve all SPE International award recipients. SPE International Awards are generally presented at the SPE Annual Technical Conference and Exhibition. SPE International Awards have a 3-year cycle of consideration. Candidates must be re-nominated every three years. What nomination and recipient statistics do you have available for the International Awards? SPE carefully monitors all programs available to members. 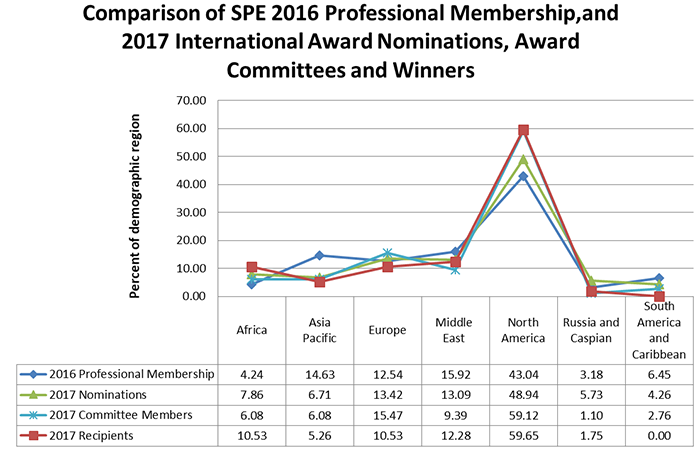 The SPE International Awards are tracked against the SPE year-end professional membership to ensure that participation in the program reflects SPE’s diverse membership. Can I nominate someone for a regional award and the corresponding international award at the same time? Yes. However, it is recommended that you carefully review the award requirements and the scope of the candidate’s significant achievement, and then nominate the candidate for the more appropriate award. What are the SPE international awards? What are the SPE Regional awards? There are 13 Regional awards in 2 categories. Learn what SPE Regional Awards recognize. When can I nominate someone for an SPE award? The annual SPE call for nominations begins in November, after ATCE. You can submit nominations through the deadline of 15 February. SPE will not extend the international deadline. Regional Directors may extend the deadline for their region. How do I nominate someone for an international award? You will need your SPE login to access the international nomination form. Your login is the email address on your SPE member record, and your SPE password. You can use the login help link, or contact service@spe.org for assistance with your SPE login and password. Review the international award criteria. Select the appropriate international award. Include all requested information on the form. Collect and submit up to three letters of support for the nomination from colleagues or request up to three letters of support from colleagues. Submit the nomination by the 15 February deadline. How do I nominate someone for a regional award? You will need your SPE login to access the regional nomination form. Your login is the email address on your SPE member record, and your SPE password. You can use the login help link, or contact service@spe.org for assistance with your SPE login and password. Review the regional award criteria. Submit the nomination by the regional deadline. Do I have to receive a regional award before being considered for an international award? No. It is not necessary for a candidate to have received a regional award to be considered for an SPE International award. Do regional award winners qualify for international awards? Yes, many regional award recipients become candidates for the corresponding international award the following year. Regional Outstanding Young Member Award winners become candidates for the SPE Young Member Outstanding Service Award, or if over the age of 35, the SPE Distinguished Service Award. Regional Technical Awards become candidates for the equivalent SPE technical award. Regional Service winners become candidates for the international SPE Distinguished Service Award. Distinguished Faculty Achievement Award winners become candidates for the SPE Distinguished Achievement Award for Petroleum Engineering Faculty. Regional Public Service Award recipients become candidates for the SPE Public Service Award. Do regional award recipients moving into international consideration need to submit a new international award nomination form? Regional recipients are automatically placed into consideration for the corresponding international in the year following their regional win. Nominators are contacted to update the nomination and provide letters of recommendation. Updates to international nominations are accepted during the call for nominations, from November through 15 February. International award committees expect levels of documentation in regional nominations to equal that of direct international nominations. International award committees may choose not to review nominations that lack sufficient documentation. What do award committees look for in an SPE international award nomination? Concise, well-written nominations backed up by brief yet complete documentation that support the award requirements accompanied by personal letters from professional colleagues who endorse the nomination will help award committees. Incomplete nomination forms, insufficient documentation, excessive repetition, lack of specific examples that support the award requirements, and lists of every published document may cause the award committee to reject a nomination. Do award nominees have to be members of SPE? In the case of the Cedric K. Ferguson Medal and Certificate, the candidate author(s) must be an SPE member in good standing at both the time of peer approval and when the award is presented. The Ferguson Medal is the only SPE award that can be presented to a student member of SPE. Are there any age limits on SPE award nominations? A Young Member Outstanding Service Award candidate must be an SPE professional member in good standing under the age of 36 during the year the award will be presented. The Ferguson Medal is presented to an author under the age of 36 at the time of peer approval and during the year the award is presented, and who is an SPE member in good standing both at the time of peer approval and when the award is presented. The Lester C. Uren Award requires the candidate to have been under 45 years of age when the work being recognized by the award was completed. There are no other age requirements for SPE International Awards. Are students qualified for SPE awards? No. The SPE Awards Program is for professional members. Candidates for awards requiring membership must be professional SPE members. The exception is the Cedric K. Ferguson Medal. It is the only SPE award that can be presented to a student member of SPE. Students can check with their chapter to learn about local awards available to student members of SPE. Can someone serve on a committee and still be an award nominee? Members of the SPE Board of Directors are not eligible for international awards for the duration of and for 2 years after the expiration of their term of service, with the exception of the SPE president, who automatically becomes a Distinguished Member upon the completion of his or her term. International award committee members are not eligible for the award they are judging for the duration of and for two years after the expiration of their term of service. How long does someone remain a candidate for an international award? An international candidate remains on the active consideration list for three years unless they receive the award or they no longer meet the award criteria. For example, a candidate for the Young Member Outstanding Service Award may turn 36 during the 3-year cycle. In that case, you can nominate the candidate for the SPE Distinguished Service Award. If updated by the original nominator, regional winner nominations entering international consideration will remain active for three years. If not updated, regional recipient nominations will be considered for one year. The three-year active consideration cycle begins the year SPE receives the first international nomination for a candidate. When the three-year active consideration cycle expires, all material associated with the nomination expires, including letters of recommendation, updates and any interim nomination forms. After a nomination expires at the end of the three-year cycle, you can renominate the candidate if they still meet the award criteria. Can I review my award nomination? No, nominees cannot have access to the nomination packet. SPE International Award nomination materials are confidential. SPE staff can only provide a candidate’s name, the award, and the nominator’s name. SPE staff cannot release additional information about the nomination packet, and cannot provide the list of endorsements. The nominator can only have access to the nomination form and support letter they provided. They cannot have access to the other nomination forms or support letters in the packet. Can I remove a nomination I submitted? Award nominations are managed by the nominator and may be removed from the consideration only by the request of the nominator. SPE must receive your request during the annual call for nominations. Once judging begins, nominations cannot be removed. The candidate pools are fixed until the international award recipients are announced after approval by the Board of Directors. Each international award nomination received by SPE is considered individually. If you request that a candidate's nomination be removed, only your nomination for that candidate will be removed. How many times can someone receive an award? An individual may receive each international award only once, with one exception. The Cedric K. Ferguson Certificate, which is presented to coauthors of papers selected for the Ferguson Medal who are professional members in good standing over the age of 35, can be received more than once. What is the deadline for international award nominations? SPE staff must receive all international award nominations and letters of recommendation by 15 February. There are no extensions. What is the deadline for regional award nominations? SPE staff must receive all regional award nominations by 1 March. There are no extensions. Where do I send award nominations? You will need an SPE login to access the nomination form. Your login is the email address on your SPE member record, and your SPE password. You can use the login help link, or contact service@spe.org for assistance with your SPE login and password. How are award committee members selected? 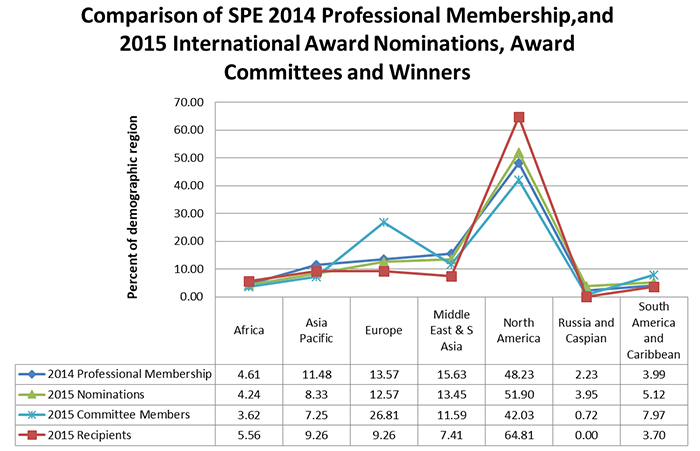 SPE international award committees consist of six or more geographically diverse SPE members serving 3-year terms. The SPE President-elect annually appoints two committee members to each award committee. These appointments are subject to the approval of the SPE Board of Directors. Committee members have an interest in the discipline of the award, and are distributed geographically as widely as possible. What are the length-of-membership honors? 25-year Club Member – Individuals with least 25 years of membership in SPE become 25-year Club Members. This select group of members is welcomed to visit with peers in the 25-year and Century Club Room during the SPE Annual Technical Conference and Exhibition. A member reaching this distinction also receives a 25-year membership certificate. Senior Member – After 30 years of continuous membership with SPE and upon reaching the age of 65, a member is automatically considered a senior member. Senior members receive a 50% reduction in membership fees. A member who is retired at age 60 may submit a written request for senior member standing to SPE Customer Service at service@spe.org. Legion of Honor – After 50 years of continuous membership in SPE, a member is automatically inducted into the Legion of Honor. Legion of Honor members are exempt from SPE dues for life. They also receive a certificate in honor of their achievement, free registration for all SPE Annual Technical Conference and Exhibitions, and recognition in the Journal of Petroleum Technology. You can direct questions about these honors to service@spe.org. Can I nominate a colleague for the Ferguson Medal? No, it is not necessary to nominate candidates for the Ferguson Medal. All peer reviewed papers published in SPE technical journals with authors or coauthors who are SPE members under the age of 36 at the time of peer approval are automatically considered candidates for the Ferguson medal. SPE members ordinarily resident in a country embargoed or sanctioned by the United States government and European Union are not eligible to participate in the SPE Awards Program. Click here for more information. When will I find out the names of the award recipients? International award recipients will be announced after the SPE Board of Directors approves them at the June Board meeting. The list of international and Regional award recipients will be posted on SPE.org and published in the Journal of Petroleum Technology. International award recipients are presented with a certificate, plaque, or medal commemorating their achievement. They receive complimentary registration for the Annual Technical Conference and Exhibition (ATCE) and tickets to the event at which the award will be presented in front of their professional peers – either the Annual Awards Banquet or President’s Luncheon. Regional award recipients receive a trophy that is presented by the Regional Director at an appropriate regional meeting. Who can I contact with questions about the SPE Awards Program?